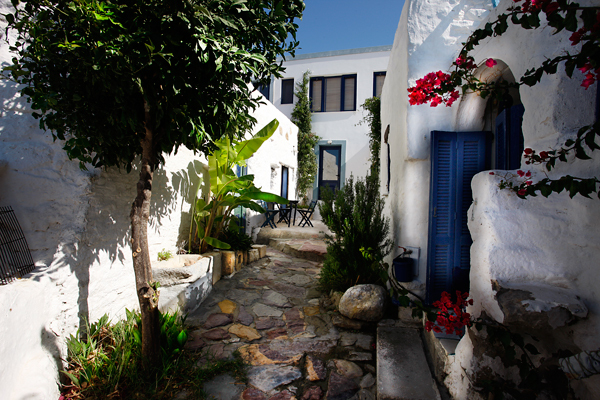 Our traditional Greek house is situated in Lahania or (Lachania) which is one of the most picturesque villages on the island of Rhodes. It has recently been extended to create a three double bedroomed house which brings together, and joins the original two older buildings, forming a complex of buildings that surround a small secluded very private pretty courtyard garden, ideal for sun bathing. Two flat roof terraces provide further areas to relax and soak up the sun. The buildings comprise of two sitting rooms, a study, two shower rooms, two kitchens and three double bedrooms. The house can sleep up to six people. A wood burning stove heats the house during the winter months and one of the bedrooms also has a fire place. One double bedroom has air conditioning to keep you cool during the hot summer nights.